San Francisco, CA, July 16, 2013 — Tandem and GreatSchools are working together to make online school calendars more accessible to families around the United States. 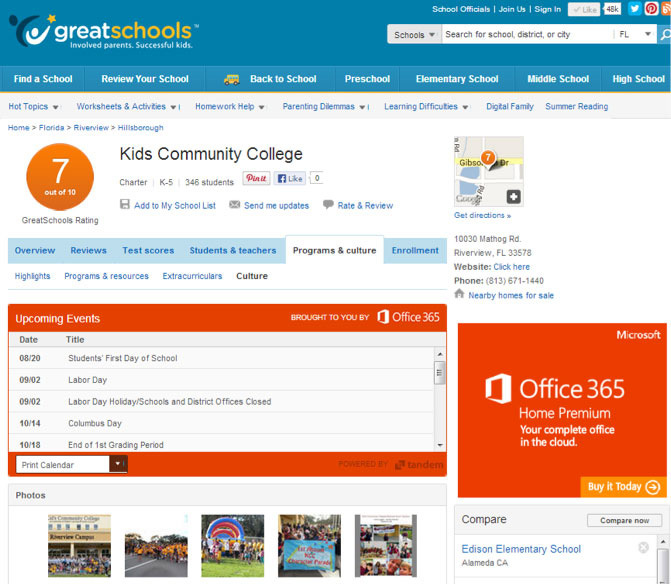 With support from Microsoft Office 365 Home Premium, GreatSchools and Tandem will feature free school calendar information on the GreatSchools profiles of about 40,000 K-12 schools. Adding school calendar information to GreatSchools profiles will help families keep track of important information like school start dates, holidays, enrollment timelines, and special events. Parents can easily download the information to their own calendars. As the nation’s leading source of school information, GreatSchools is always working to provide families with more news and insights about their schools, and to help families and schools communicate. Founded in 1998, GreatSchools is a national nonprofit that helps parents get a great education for their children. Our Webby award-winning website, GreatSchools.org, helps families make crucial decisions about where to live and where to send their children to school. GreatSchools.org is the nation’s leading guide to PreK-12 schools, with profiles of 200,000 public and private schools and more than one million ratings and reviews by parents, teachers and students. In addition, GreatSchools.org offers thousands of articles, videos and worksheets that give parents practical ways to support their children’s learning. Last year we reached 44 million people, including half of all American families with school-age children. Headquartered in San Francisco, GreatSchools has local programs in Indianapolis, Milwaukee and Washington, DC. Tandem is an online tool that enables schools to provide free, updated calendar information to their communities, and helps schools and communities stay connected. To set up a free school account, visit www.tandemcal.com. Follow Tandem on Twitter at @tandemcal or on Facebook at facebook.com/tandemcal.